in Manessi and Trikorfo Messinia. & State of Art Facilities and Design. One & Olive holds precious secrets carried through 5 generations and carefully kept for more than 120 years and embottled using pioneering technology. One & Olive holds precious secrets carried through 5 generations and carefully kept for more than 120 years. In 1896, papa-Apostolis (the village clergyman) supported the local economy by producing the best olive oil in the region of Messinia. For over a century since, this family tradition has been taking place in the vicinity of Kalamata, in the small mountain village of Manessi. the warm Greek sun, the salty breeze between the leaves and the fruitful earth nurturing the Koroneiki olives. Looking at the bottle we see a farmer, inspired by Cycladic Art. The farmer with the crossed hands is a notion for the feeling of completion that one has after a hard day of work in the fields. Nature-inspired with colours of the Greek countryside. you will taste the warm Greek sun, the salty breeze between the leaves and the fruitful earth nurturing the Koroneiki olives. The name of this olive oil is in line with it's vision. "One" for it's uniqueness and "olive" for it's contrariety to standardization. Appearance: Rich dark green colour with thick texture. Aromas: Fresh and balanced fruity aroma with almond and green notes. Palate: Full, fruity and peppery flavour with rich mouthfeel. Followed by a delicate and bitter almond aftertaste. Rare aromas for the Koroneiki variety. With just a drop of One & Olive you will taste the warm Greek sun, the salty breeze between the leaves and the fruitful earth nurturing the Koroneiki olives. With a drop of One & Olive your senses and creativity will be awaken. close to you and your beloved ones. with two authentic recipes: Traditional & Spicy. The healthiest snack and core element of the Greek lifestyle & gastronomy. Be part of our One & Olive Family. Exclusively extracted from Koroneiki Olives. Harvest period: 22 November 2018 - mid February 2019. Dry & warm summer and fall period. Humid & Cool winter with frequent showers. Cooler temperatures and less frequent showers compared to 2016 - 2017 period. One & Olive respecting the natural cycle of the olive oil production is extracted exclusively from Koroneiki Olives. The variety of Koroneiki olives is well known for its exceptional and fine fruity taste, enriched with the Mediterranean temperament. The One & Olive family grew following the ancient tradition of olive oil production honouring nature for this unique gift, whilst guaranteeing sustainability throughout future generations. With great attention to cultivation, the One & Olive family of farmers share the same sense of responsibility, dedication and respect for their olive trees, during cultivation with extra care. With respect to the natural cycle of the olive tree cultivation, the olive trees are naturally irrigated. The Greek weather guarantees this result and the weather in Manessi & Trikorfo, Messinia guarantees One & Olive superior quality, fine aromas and fruitful taste. During 2018 cultivation period, the weather was moderate to dry with cooler temperatures. Average temperature: 18.6�C. Average high temperature: 24.1�C and average low temperature: 13.6�C. Average wind speed with light breezes mainly from the west. - Winter 2017 - 2018: Humid & cool winter with 9.1�C average temperature. Average high temperature: 13.3�C and average low temperature: 5.6�C. Frequent showers and few days of early-hour snow during months of January - February 2018. - Spring 2018: Moderate spring period with 15.7�C average temperature. Average high temperature: 21.3�C and average low temperature: 10.5�C. Few showers during March and May 2018. - Summer 2018: Dry & warm summer with 26.5�C average temperature. Average high temperature: 32.8�C and average low temperature: 20.5�C. Few showers during July 2018. - Fall 2018: Dry & warm fall period with 18.03�C average temperature. Average high temperature: 22.2�C and average low temperature: 14.4�C. Few showers during October 2018. Harvest period begins on 22 November 2018 and is completed during February 2018. The extra virgin olive oil is extracted within hours after being handpicked. The intense work of our One & Olive family of producers and agricultural experts as well as the fruitful countryside of Manessi & Trikorfo, Messinia are the key elements for this superior olive oil. Using state of the art technology, One & Olive has the most advanced and innovative olive oil production unit, globally. One & Olive has established a strategic cooperation with Alfa Laval, the leading company in olive oil extraction. 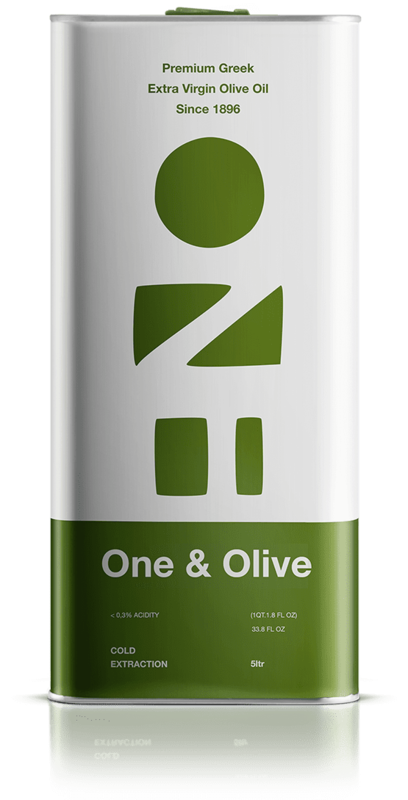 Through this collaboration, One & Olive is the center of innovation and optimization, delivering the most authentic olive oil in Greece. Through the production process we protect the extraction of olive oil, minimizing its contact with oxygen. We guarantee the highest quality with extra care in delivering an authentic Greek olive oil experience. One & Olive focusing on innovation and quality, operates a state of the art production and bottling unit in the heart of Greek tradition. One & Olive has established a strategic cooperation with Alfa Laval, the leading company in olive oil extraction. Through this collaboration, One & Olive has the most advanced and innovative production unit, internationally. This advanced technology guarantees the least contact with oxygen during the production process, while delivering fresh olive oil in less than 14 minutes. After harvesting the olives, they are processed within few hours, assuring low acidity, rich taste and high nutritional values. In the initial stage of production, the fresh olives go through large fans, which separates leaves, branches and dirt from the product. Then, the olives are washed two times with water. In the next phase, the olives are crushed into an olive paste. After this process, One & Olive innovation comes in, where the traditional process of malaxation does not occur. The temperature is homogenized in just one minute without any contact with oxygen. Thus, without further pressing and stressing the olive paste, it is slightly heated to 27°C (81°F) before it is directed to the centrifuge. This innovative process takes place in 30 seconds, instead of 40 minutes according to the traditional method. One & Olive is the first and only company using this method globally gaining reduced contact with oxygen, increasing One & Olive's high quality and making the process more efficient, while also saving energy. One & Olive respecting nature and promoting sustainable development for the next generations, minimizes the impact to the environment and climate change. Afterwards the centrifuge separates the juice from the paste using a two-phase extraction with total capacity of 15,000 kg per hour. With this method One & Olive retains the olive oil's high quality, protecting the invaluably rich source of polyphenols, whilst reducing water waste. Finally, the olive oil goes through three separators, where the olive oil is separated by the sediment water. 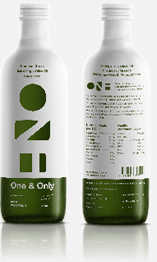 One & Olive is then transported to storage tanks before bottling takes place within hours. The bottling process takes place in an automated and fully controlled bottling department at the One & Olive unit, meeting strict standards. During the production process of One & Olive we protect the extraction of olive oil, minimizing its contact with oxygen. We guarantee the highest quality with extra care in delivering an authentic Greek olive oil experience.